Bombardier vs. Boeing: Tariff Row or Opportunity? An increasingly protectionist United States has suddenly announced a 219% tariff on Bombardier passenger aircraft. 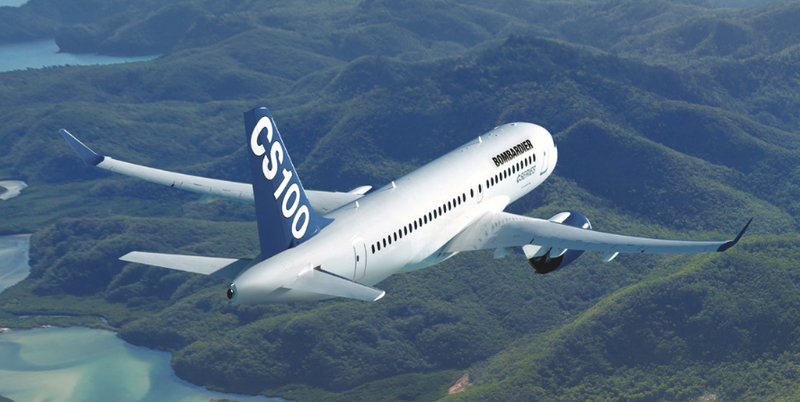 Bombardier Aerospace, headquartered in Montreal, Canada, also employs some 4000 people in Northern Ireland who produce a significant percentage of the components used in the C-Series passenger jets (CS 100 and CS 300) that have recently entered production. Switzerland has already taken delivery of some of their C-Series jets, with others to be delivered in the coming months. Airlines from Germany, Finland and other European nations have indicated huge interest in these modern and fuel-efficient airliners, and China has told the company they will take as many planes as Bombardier can produce. Bombardier C100 passenger aircraft. Image courtesy of BombardierAerospace. There isn’t a better commercial aircraft in the 100-150 seat market in the world today. And if that sounds like advertising copy, it’s because the aircraft the C-Series competes against were originally designed in the 1970’s (Boeing 737) and 1990’s (Airbus) and early 2000’s (Embraer) and although those aircraft lines have received numerous upgrades over the decades, from an engineering point-of-view nothing beats starting with a clean sheet. This allows designers a free hand to use the latest composite materials, fully digital electronics instead of digital-over-analog, and 100% CAD/CAM design and manufacturing instead of only part of the process being CAD/CAM (Computer Aided Design/Computer Aided Manufacturing) all of which means there are no engineering compromises. When you have the best plane on the market in that particular segment, one that boasts the quietest takeoffs and landings (significantly quieter) and the best fuel mileage, and the lowest maintenance cost per mile — high tariffs in one country means you simply sell the same number of aircraft per year — but you sell them to different countries. China can’t get enough commuter aircraft from all sources it seems, and its own fledgling passenger aircraft manufacturer is geared towards truly excellent jumbo jet airliners. The country needs almost 7000 new aircraft over the next 20-years. All good news for Bombardier there! The company should easily score 1/3 of all single aisle passenger jet sales in China over the next 20-years. And if they can’t, the entire executive staff of Bombardier should be exiled to Antarctica for life. Yes folks, opportunities like this don’t come along once-per-decade, nor even once-per-century. Just in case you’re counting along at home; If Bombardier receives 1/3 of all single passenger jet sales in China over the next 20-years, it would need to deliver 6-jets per day to China. The future couldn’t be brighter for Bombardier and its clients. A missed deal with the United States might in retrospect turn out to be the best thing that ever happened to the company. Instead of thinking ‘regional’ — it’s now time to think ‘global’ — thanks to the U.S. Commerce Department. Trade war, schmwade war! In the 21st-century, the name of the game isn’t getting into fights with your competitors, it’s about out-succeeding them. “According to a new report from the U.S. Department of Energy, solar power employs more people than coal, oil and gas combined. Last year, solar power accounted for 43 percent of the Electric Power Generation sector’s workforce, while fossil fuels combined employed 22 percent. The statistic will be welcomed with open arms by those trying to refute Donald Trump’s assertion that renewable energy projects are bad news for the U.S. economy. Around 374,000 people were employed in solar energy, according to the report while generation through fossil fuels had a workforce of just over 187,000. The solar boom can be attributed to construction work associated with expanding generation capacity. Renewable Energy = Clean Air and Twice as many Jobs on 1/4 the Subsidy! Here is a look at historical U.S. federal subsidies paid from 1918 to 2009 for various energy producers. Cumulative U.S. Federal Energy Subsidies from 1918 – 2009 | What Would Jefferson Do? What Do Americans Think About Fossil Fuel vs. Renewable Energy? Solar power and wind power (alone!) employ almost twice as many Americans as all nuclear and all fossil fuel power plants combined, but renewable energy gets only one-quarter of the subsidies in from 2010 onward. Which might be a factor in the minds of Americans who look forward to renewable energy meeting their future energy demand. Renewable Energy Continues to Grow in the U.S. Despite the low subsidy amounts paid to renewable energy in the United States, non-hydropower energy continues on its growth trajectory and it’s now cheaper to build new solar capacity, than to build new coal capacity. Costs for new solar power plants continue to plummet (without subsidy) vs. new coal power plants (with a small subsidy) is reflected in the Levelized Cost of Electricity (LCOE) per Kilowatt Hour price. Many coal-fired power plants and several nuclear power plants produce well over 1000MW (1 GW) of electricity and it is easy to extrapolate their water usage. For instance, a 1.6 GigaWatt(GW) coal-fired power plant (for the purposes of this discussion there’s a 1.6GW coal-fired power plant in Texas) uses 1,760,000 gallons of water per hour, while an equivalent-sized nuclear power plant uses 1,280,000 gallons of water per hour. Meanwhile, a natural-gas-fired power plant producing the same 1.6GW of electricity would consume 480,000 gallons per hour, while a 1.6GW solar or wind power would consume zero gallons per hour. Of course hydro-power does not consume any water during its decades of reliable power production, water merely falls through turbines and back into the river a bit further downstream — although during the construction of the dam, spillways, and hydro-electric turbine rooms, millions of gallons of water are used to make the concrete. Renewable generation capacity expected to account for most 2016 capacity additions in the U.S. The chart below shows just how much wind power in the United States has grown in recent years. U.S. Solar PV Power Installations 2010 to 2020. Image courtesy of GreenTech Media and Solar Energy Industry Association. The chart below displays total utility-scale capacity additions from 2010 to 2016. For the third consecutive year, more than half of the capacity additions are renewable technologies, especially wind and solar. From 2013 through 2040, U.S. electricity demand is expected to grow approximately 1 trillion kiloWatt hours(kWh) with natural gas and renewable energy showing steady growth, while coal-fired power generation and nuclear power show slight declines according to the U.S. Energy Information Administration. If the United States converted their existing coal-fired power generation to natural gas by 2020, the U.S. could easily meet every international and domestic clean air target until 2050 as coal burns 10,000 times ‘dirtier’ (anthracite, or black coal) to 1,000,000 times ‘dirtier’ (lignite, or brown coal) when compared to natural gas. It goes without saying that if the United States replaced coal-fired power generation with renewable energy, it would surpass every U.S. international and domestic clean air target, lower U.S. heathcare and infrastructure spending by billions of dollars annually, save the U.S. billions of gallons of fresh water per month, provide millions of good-paying jobs for American workers — and prove the United States is still an exceptional power in the 21st-century. Not bad!